So I hear someone paid 14.165 million bucks (that is not a typo) for the Bay Psalm Book of 1640, the first book printed in North America-- in English, let's be sure to add, because the first book printed in North America was printed in Mexico City, almost 100 years earlier, in 1539. It was Breve y mas compendiosa doctrina Christiana en lengua Mexicana y Castellana by Padre Juan de Zumárraga and the printer was Giovanni Paoli, known as Juan Pablos in Mexico. Well, take that and put it on your taco! My own latest rare book acquisition, of a Mexican book of 1906 from a used / antiquarian bookshop in Mexico City, was a far more modest purchase-- but important in its way. 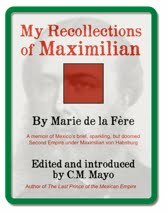 This three minute video that shows some pages from the book is in Spanish-- but if your Spanish is rusty, no worries, you'll get the idea if you know that Francisco I. Madero was the leader of Mexico's 1910 Revolution and President of Mexico 1911-1913. Alas, I lack the coordinating wardrobe. 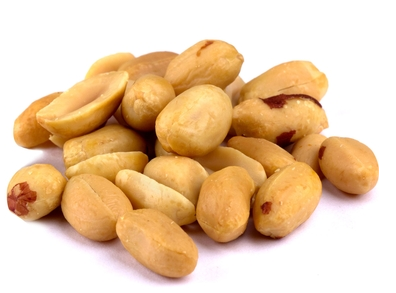 25 pounds of roasted unsalted peanuts. Rare books pricing is a rather mysterious endeavor. Bring your pendulum. She informed us that a local dealer had offered $10,000 for the library. I told her we’d pay her $15,000 if she’d let us pick through the collection and take what we wanted. Otherwise, we’d pay her $13,500 if we had to take it all. She cocked her head at this upside down proposition. Locusts screamed in the trees. Then she got it. 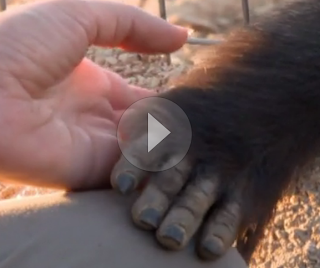 “$13,500,” she smiled. The Bajío, a rich agricultural, mining and industrial region north of Mexico City, does not even appear on most English-speaking peoples' mental maps of Mexico. North of the U.S.-Mexico border, the best word to describe the image of Querétaro, the Bajío's first and still thriving major city, would probably be "obscure." And yet Querétaro, founded by Otomís and Franciscan friars in 1531, may be the hometown of capitalism-- so argues John Tutino in Making a New World: Founding Capitalism in the Bajío and Spanish North America, a nearly 700 page tour de force of original research heavy with appendices, yet with such a wealth of novelistic detail, the reading itself trips along like a novel. While not denying the role of England and its North Atlantic colonies, Tutino points out that because they dominated the capitalist world after 1800, the origins and nature of what preceded it—sparked by Ming China's demand for silver and Spain's American colonies' ability to provide it—have been overlooked. The main early silver mines in the 16th century were Potosí in South America and Zacatecas, in the Bajío north of Mexico City. It was this nexus out of which flowered the international trade and culture of capitalism. 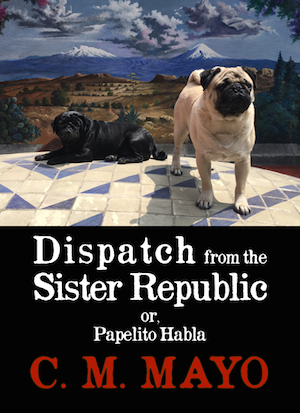 "[T]the Bajío and Spanish North America were not ruled by a dominant Spanish state; they were not led by men more interested in honor than profit; they did not organize work mostly by coercion. Life was not ruled by rigid castes; communities were no constrained by an imposed Catholicism that inhibited debate. They were instead societies founded and led by powerful, profit-seeking entrepreneurs of diverse ancestry." My ever-growing embryonic list of recommended books on Mexico. P.S. My interview with John Tutino will be podcast #13 (hey, I say that is a lucky number!) in the Marfa Mondays Podcasting Project. Stay tuned. 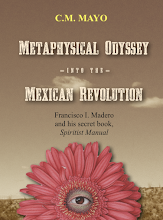 Meanwhile, I am still battling the fallout of the asteroid, that is, my new book, Metaphysical Odyssey into the Mexican Revolution: Francisco I. Madero's Spiritist Manual Introduced and Translated. Updates about that anon. Watch the whole fascinating and beautifully filmed documentary by Craig Foster, featuring Anna Breytenbach, at Culture Unplugged. Sweethoots: hatmaker to the pugs. Yes. Yes! Scatological incident over the Bermunda Triangle, no less. (Very amusing). Dig the wrapping paper concept: For when you're feeling a bit blasé about the Philippines and such. 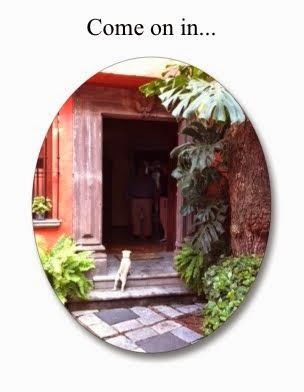 Obviously, I am procrastinating... back to updating my website for Metaphysical Odyssey Into the Mexican Revolution. ' UPDATE: UPDATED. The Kid’s Lit Conference was held in Austin, Texas on November 8 & 9, 2013 with keynote speaker Cynthia Leitich Smith of the blog Cynsations noting aspects of a great blog. Her first recommendation is to have a central mission or philosophy to your blog. Hers is “diversity” which ties to her YA books on native Americans and other culturally diverse characters. Cynthia woke me up to the theme that runs through my writing of “believing in Mexico” and wanting to share the passion I have for my adopted country. This is what keeps me motivated and brings me energy and rewards for making stuff up for a living. Pam Coughlin, conference organizer, contributor to the Cybils, and KidLit blogger at Mother Reader also did a session on blogs that reminds us to have our names clearly stated at the blog site no matter what our blog tag may be, like Madam Mayo (...don’t miss her November 11 post on self-publishing at the Writer’s Center). Additionally, a reader should be able to find what books the blogger has written. 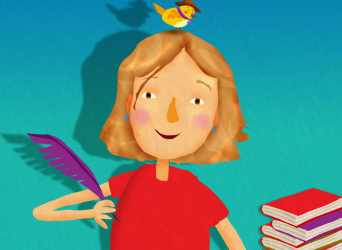 And finally, post dates on blogs to give the reader an idea of how current is the writing. The rule for posting is “better to be regular than frequent”. Don’t miss Pam’s wonderful book giving ideas for the holidays on her website. Biggest take away from attending a conference of bloggers in my writing genre was real connections with new friends. Exposure to a picture book reviewer like Rosemond Cates at Big Hair and Books provided a wealth of new children’s books with excellent reviews. My website blog at http://www.marylynnpattonbooks.com will see revisions that reflect these new ideas shared at the conference. I highly recommend attending a bloggers’ conference, especially in your writing area of interest. 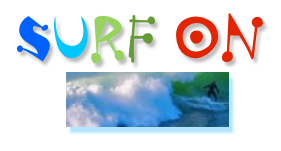 >Check out Mary Lynn Patton's previous guest-blog, iWorld is Upon Us. >Complete archive of Madam Mayo guest-bloggers, including Lisa Carter, Joanna Hershon, David Lida, and many more, here. 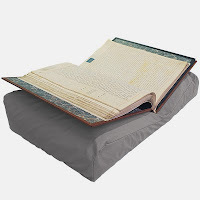 The Norton book sofa: perfect for rare book collectors. So whimsical: KnobCreek Metal Arts bookends on etsy. Not sure how to get started with rare book collecting? ABC for Book Collectors by John Carter and Nicolas Barker. And do buy Leslie Pietrzyk's novels! P.S. Highlights of her recent talk for the Writer's Center's Leesburg First Friday series on writing short fiction and long fiction here. Books, books, books! Bookman's Log! 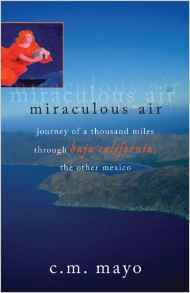 For Baja Buffs and soon-to-be-Baja Buffs: Miraculous Air: Journey of a Thousand Miles through Baja California, the Other Mexico. The rest of the gang is here. P.S. I'll be posting my top 10 reads for the year in the next couple of weeks. Last year's, topped by Sara Mansfield Taber's lyrical Born Under an Assumed Name, is here. Apparently the latest mind-blower is an Interactive Dynamic Shape Display. Those British pod-like self-driving thingies. (Once again, hat tip to Marginal Revolution). Who would have thought? A major Mexico collection in Hawaii. Oh, Karma, you are just so fab. Nancy Marie Brown on Icelandic Witchcraft. Chip Kidd says Good is Dead. Well, OK.
One of the speakers at "Publish Now!" was my fellow Writers Center board member, historical biographer Ken Ackerman, who found that his big NY publisher wasn't interested in reprinting his Young J. Edgar Hoover-- even though the Leonardo DiCaprio movie was about to come out (!) In the seminar, Ackerman talked about how he then plunged into self-publishing and, step by step, put together the paperback POD (print on demand) editions of Young J. Edgar Hoover-- and his other biographies, all then languishing in publisher's warehouses or effectively out-of-print-- through CreateSpace and Lightning Source, plus ebooks for Kindle, iTunes and Nook. He held up the four self-published new paperback editions of his books and my, they did look beautifully designed. Seriously, Ken, you are an inspiration. As another well-published writer friend of mine put it, we authors are suffering from "an erosion of support" from our publishing houses. Well, in my own case, this is indeed the case with some of my publishers, but certainly not all. Over the years I've had several books placed with an array of publishers, from international corporate behemoths (Planeta and Random House Mondadori) to university presses (Georgia and Utah), small presses (Milkweed Editions, Unbridled Books, Whereabouts Press) and.. drum roll... yes, I have self-published. It used to be that self-publishing was for those whose work was not up-to-snuff or who were too naive or lazy or easily intimidated by the traditional publishing process. Yes, there has always been some work of great but not commercial value, but in a word, "self-published" was not a label anyone with a shred of ambition would want-- unless they were Walt Whitman, but that's another blog post. And today self-publishing is wide open-- it doesn't even require money to do a Kindle, and compared to the past, very little to do a paperback, so just about anyone can publish just about anything. And therefore, we have an unimaginably vast and exponentially growing mountain of... well, let's just say I do not know how to appreciate most of it. But I did self-publish back in the Crustaceous, I mean, 2002, with The Visitors / Los visitantes, which is the second chapter of my memoir, Miraculous Air: Journey of a Thousand Miles through Baja California, the Other Mexico, a book that was published by the University of Utah Press in 2002 and Milkweed Editions paperback in 2007. (And much later, the ebook of Los visitantes, pictured left, by Yours Truly.) It was both time consuming and expensive-- back then POD wasn't really done, that I know of, so I had a professionally designed cover and interior and the whole thing was offset printed in Canada. (And not to mention the design and printing, boy howdy was shipping expensive.) But I was able to sell a few of the books and give away more, and no doubt this helped more readers find Miraculous Air. In all, a learning experience. I was not eager to repeat it, however. But ebooks, that is another story. Yes, some headaches with formatting and figuring out to work with the iBooks Author app and Kindle. But in all, compared to the past, it is jump-up-and-down cheap and easy. I love it! Why? (6) NO PAPERWORK HEADACHES DEALING WITH FULFILLMENT. In other words, when someone orders one of my ebooks on amazon.com or iTunes, all I have to do is wait... I will get paid. I don't have to provide an invoice to individual customers, I don't have to ship anything. Oh, wonderful, wonderful. Basically, once you get your ebook up there on amazon.com or iTunes, what you have is a variable rate annuity. Probably with a very low yield-- indeed, for most authors, a Kindle edition of their book won't earn back the cost of their time and trouble. But should things change, the upside is the moon. What's interesting-- to say the same thing a little differently-- is that the marginal cost of increasing supply to meet any increase in demand is essentially zero. Whether one person or 100,000 people download your ebook, it doesn't matter; they click, they get. Of course the importance of editing-- that step so disdained, and to their detriment, by most self-publishers-- was underscored by novelist and freelance editor Barbara Esstmann. For last year's "Publish Now!" seminar I gave the talk-- her title-- "The Manuscript is Ready -- or Is It?-- What's Next?". My own talk focused on travel writing and interactive books. 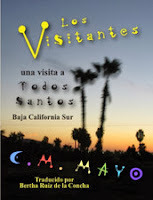 I mentioned my own ebooks, Podcasting for Writers, From Mexico to Miramar or Across the Lake of Oblivion, and others, and for examples from the cutting edge, Mary Lynn Patton's children's iBooks with sounds, including Sounds of Mexican Beaches, and Rich Shapero's Too Far. P.S. 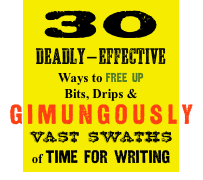 I lifted that title, "self-publishing for all the right reasons," from Kevin Kelly. Check out all he has to say about his latest nondigital self-publishing venture here. I just look at him and want to laugh-- with him. He's a sort of Edgar Allen Poe x David Byrne x Ichabod Crane x Andy Warhol x Diane Vreeland (if she ever had anything to do with Baltimore)-- beyond brilliant. Not that I relish the movies (the few I've watched seemed to me wince-worthy, at best, Divine divinely and hilariously gross). What I appreciate, sincerely, is his joy as an artist. And I almost went to Baltimore the other weekend after the Writer's Center's "Publish Now!" seminar (more about that anon). But then I didn't. Oh well. The crab cakes can wait. But not my appreciation of John Waters. "Eat food all the same color!.. Pretend to see the Marfa Lights!... The Jonestown of minimalism!" Note, my chickadeecitos, that it is priced at $3,000 and sold out. Ninety is the new... wow! Award-winning young adult writer Randall Platt offers her bodacious tips for supersonic creativity. Reality shifter Cynthia Sue Larson's new book is about Quantum Jumping. You thought capitalism originated in English and North America? Uyy, quizá que no. Femme et Fleur goes inside the art inspired by the MER KA BA (click then scroll down past the homme qui porte une veste rose). And if your mind is really open, I mean reeeeeeally open, have a listen. If you're afraid of things that go bump in the night, do not.